ajatule samāne: why are these two word in masculine locative singular- does it deal with their respective positions in the group ? No, that's actually the feminine nominative dual (because Aries and Libra are two signs and tulā, the final member of the compound, is feminine). The text you've found (at DLI?) isn't a commentary but the actual text (mūlamātra) of the Hāyanaratna. As you can see, it shows that the rising times of Aries and Pisces are identical, and similarly of Virgo and Libra. It doesn't explain why Aries and Libra are called 'middling', 'equal' or 'similar', though. The DLI text end with iti followed by the explanation, so I thought it was a commentary on the original. The upright signs approximate the solar half of the zodiac (Cap being the exception) and the lunar half the other side. The signs of the lights seem to be more "upright" than the signs of Saturn. This is only true in the northern hemisphere. Mathematically it is possible for the signs adjacent Libra/Virgo (Leo/Scorpio) to have greater ascension than Libra/Virgo. I'm not sure how Scorpio can be considered more truthful (except for it being one of the mute signs) than Libra on the face of it, but in this world many things are upside down. Down under, however, the reverse. Can anyone point me at a post or an article on the net to help me understand why the summer solstice > winter solstice signs should be longer and straighter, and the the winter > summer ones more oblique and shorter (in time)? i can't manage to visualise why the peaks of fast and slow rising (and of obliquity and straightness) should be at the equinoxes. I can see that this is true with an astronomy program, but can't work out why. We can also, I think, see things in terms of an acceleration from autumn equinox to spring and a deceleration from spring to autumn. Also, if I understand right, there is a slight variation of rising times because of the precession (at a different rate than the VP) of the aphelion/perihelion axis, so the peak of rising times (and of straightness/obliquity?) will not in fact fall exactly on the equinoxes, but will vary slightly over time in a zodiacal direction, but this seems to be generally ignored in astrological discussions (e.g. Robert Hand's paper "On the Invariance of the Tropical Zodiac", and Deborah's "The Classical Basis of Antiscia". Presumably this shift would engender a slight difference even at the equator. Can anyone point me at a post or an article on the net to help me understand why the summer solstice > winter solstice signs should be longer and straighter, and the the winter > summer ones more oblique and shorter (in time)? i can't manage to visualise why the peaks of fast and slow rising (and of obliquity and straightness) should be at the equinoxes. I can see that this is true with an astronomy program, but can't work out why. I can't point you to an article, but I can try to explain why this is, as I understand it in terms of observational astronomy. Risings and settings are a function of the rotation of the celestial sphere, marked by the celestial equator, around the earth/point of observation. This rotation takes place at a constant speed, which is why we can express degrees of right ascension as time (15� = 1 hour). Because of the different inclinations of the 12 signs (or, rather, the 6 pairs of tropical signs) to the equator, if we note the points on the equator rising with the beginning of each sign (for any given geographical latitude), the resulting 12 points will be spaced apart by different numbers of degrees. (Each such point will mark the oblique ascension of the beginning of a sign.) A sign located between two equatorial points 15� apart will rise in one hour; if they are 45� apart, it will take three hours. And the more 'upright' a sign is with regard to the local horizon, the further apart these points will be. So it's a function of (a) the angle between the horizon and equator and (b) the angle between the ecliptic and the equator. I'm afraid this is beyond my ken as well. Thanks you Martin, I think I should be able to make sense of it from there, with a bit of thought. I'm with Graham, in the sense that I can't understand why the rising times peak (high/low) in the equinoxs. Is there any mention on the text for which time of the year this table was calculated? I think that the signs have different rising times during the year, as well as during the course of a single day as well. Or are those values obtained for when the sun is on those signs? Yes, I've been sitting here for the last few minutes wondering just that (why the high/low peaks are at the equinoxes). I can see that latitude and ecliptic obliquity would cause calculable variations, but I'd have thought the mean values would be at the equinoxes and the extreme ones at the solstices, but it's the reverse. But unlike Joao, I think the rising times should be the same throughout the year at a given location, it's just that they will rise at different times of day or night. And each sign only rises once in a single day, so no variation there. The thing to think about is that the angle of the ecliptic with the equator is not perpindicular, or, more to the point, it isn't perpindicular to our latitude. Think of a line drawn from the sun when it rises, when it culminates and when it sets. This line drawn through the sky is the diurnal arc which will be parallel to the equator. The ecliptic, however, does not run along this same diurnal arc you just drew in the sky. Instead, the ecliptic is going to be at an angle to this arc, the diurnal arc is parallel to the equator and we know the eclipitc is angled to the equator hence its angled to the diurnal arc too. I realise we all know this on paper but it's important to keep it in mind. Here's an image which shows the position of the sun at varying points of the day. Running through each sun is a faint line which depicts where the ecliptic was at at that time of the day. As I say, we probably all know this, but it helps to see it. So when the earth rotates it's not rotating along the same line as the ecliptic. Here's a short animation I just made to depict Aries and Libra as they rise. The thick red line can be imagined as an arc of 30 degrees of longitude which represents the tropical sign as it rises. Each frame of the animation elapses 15 minutes of clock time. Keep in mind that the earth rotates at a constant speed. Notice that the rotation of the earth, as said above, is not along the same lines as the ecliptic, the rotation is not parallel to the ecliptic. So here's what it looks like when I add in part of the diurnal arc in blue. It is along the blue line that we can imagine the earth to be spinning. So the longer the blue line the longer it will take the earth to allow a full sign to cross the horizon and rise. Hopefully what should be obvious is that it's not so much the tilt of the ecliptic at the time that the sign is rising, it is the diurnal arc along which the ecliptic will rise at that time. Clearly we see that Aries is much more slanted than Libra. And as a result, it is much shorter than Libra - the longer the line the longer it takes to rise as the earth rotates at a constant speed. Hence it takes Aries much quicker to rise than Libra, and also why we call Aries a crooked sign and Libra a straight one. All these images were taken using Stellarium software, with me adding in the blue and red lines myself, and they were all taken at the latitude of London England. The further extreme the latitude, the more extreme will be the result. Yes, that's the main point. Thanks for the illustrations, Paul. Software is useful, but for those of us with poor visualization skills, I find an old-fashioned armillary sphere hard to beat. Just giving my desk-sized one a whirl as I write this, and watching the zodiac ring wobble -- most illuminating! Thanks for the reply Paul. I knew it had to do with the angle between the ecliptic and equator line, but my doubt was why it reached the max and min peaks on the equinoxes instead of the solstices. So I downloaded Stellarium as well, and the "key" to the solution seems to be that the angle between the ecliptic and equator is maximum in the equinox, contrary to what I was visualizing.. I have to look at this a little bit better, still haven't made "the click"! Edit: Ok, I got it now! Here's a sketch that I made to understand, maybe it can help someone as well! It's for someone at a northern latitude, and the lines of projection from ecliptic to equator mark the beginning and end of the sign. Thanks to Joao for the drawings, which also make things clearer. The other point which I've realised is that I presume the opposite thing will happen as the given sign sets: the spring equinox ecliptic degree will rise fast and oblique and it will set slowly and upright, so it equals out over the day. The autumn equinox will be the opposite. The solstices will be equal at each end (I think). I'd unconsciously confused "rising" with "overall movement during the day". Okay let me try again, I think I know where the stumbling block is. You are probably thinking, okay, so the angle between the ecliptic and the equator is 23.5ish degrees at Aries, when it rises, but it's the same 23.5ish degrees at Libra, when it rises. Therefore if the angle between them is the same, why are they rising at different angles!? I hope I understand the confusion correctly. To answer let me reiterate something from my last post - the straightness and crookedness is not formed between the angles of the ecliptic and equator. It is instead formed between the horizon and the ecliptic, or, to be more accurate, it is the projection of the ecliptic, along the diurnal arc, keeping note of the angle between the ecliptic and the horizon. So far as clear as mud right? 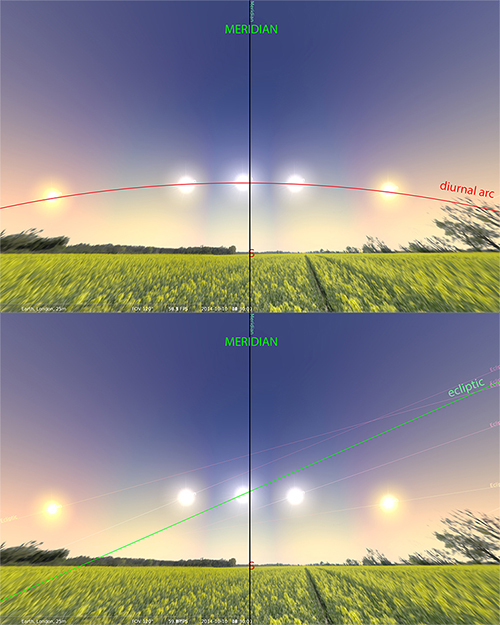 Well consider the below diagram which shows the maximum declination of the Sun on the winter solstice and the summer solstice from a northern hemisphere perspective. 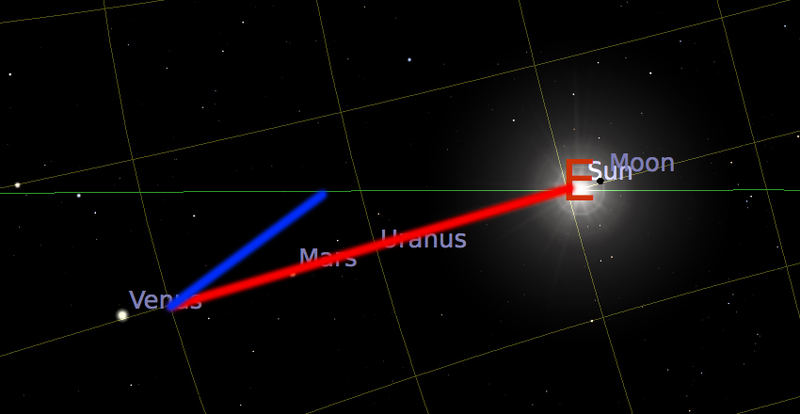 We can imagine the top sun, running through the red line, is the sun at the position of the summer solstice at midday. The red line is the ecliptic. Notice how high up the sky the sun is and therefore the wide, steep angle the red line makes to the horizon (the black line). Similarly the lower sun is the sun at midday on the winter solstice. Much lower in the sky. 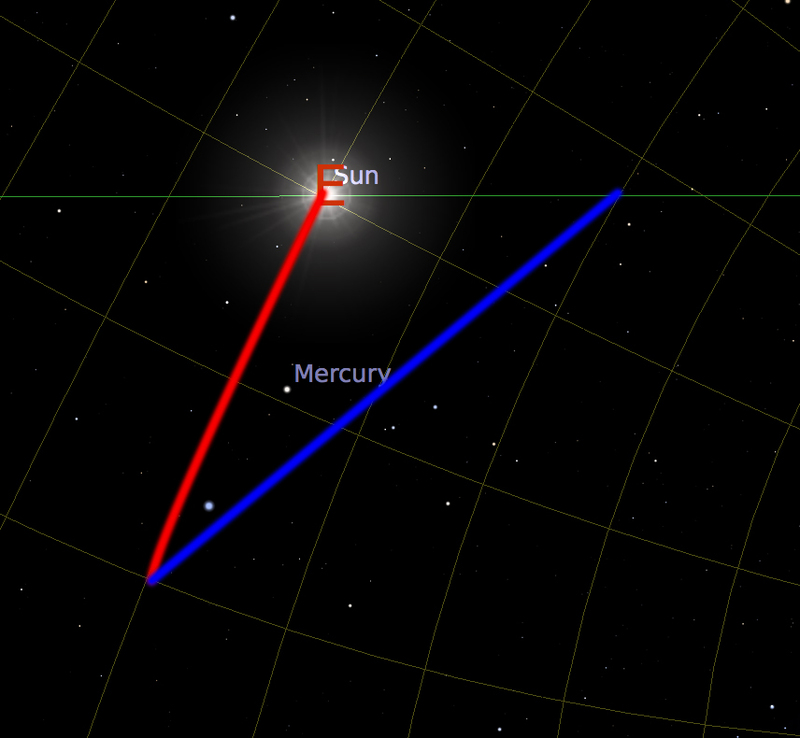 The blue line is the ecliptic, and notice how shallow the angle is, the angle is much smaller. The closer the lines get to the horizon, the smaller the angle between the ecliptic and horizon will be there, the higher up, the wider the angle. So let's do a thought experiment, or a real one if visualising is difficult. Imagine you take out a large coin, in england we have large �2 or 2p coins, so imagine you take out the largest coin you have. If you can't imagine that, imagine instead the lid of a tin of pain, or a frisbee or something similar. Hold it out right on front of you so that you are holding it in two hands, your left hand holding it on the left side, the right hand holding it directly opposite on the right side. Imagine you are looking at it full on so you can't see any of the edge. Now rotate it with your fingers, so that the top part of the coin is rotate back away from you, with the bottom coming up toward your eye line such that you can start to see the bottom edge of the coin. Make it so that you can only see this bottom edge. In our analogy the rim of the coin is the ecliptic. Were you to start turning your hands slowly in a clockwise direction, like you would if you were holding a steering wheel and turning right, you will see that very suddenly the entirety of the left edge rises above your eyeline all at once. In our analogy, the eyeline is the horizon, so imagine the bottom half of the coin, beneath where you are holding it, is hidden beneath the horizon, we can only see the top half. Put it back so that you are looking at straight on again, with no edge visible, and holding it on the left and right again. Were you to rotate it again, you will see it takes much longer to rotate the coin enough for a segment of the edge to completely rise above the eyeline. So now look at the image of the solstices again, and try to rotate the coin always back and away from you so you only ever can see the bottom rim/edge of the coin. You will notice that the angle the rim of the coin makes with the 'horizon line' becomes shallower and closer to 0� the more you bring the top edge down, and it becomes closer to 90� the more you bring it up until you are looking at it full on. Well the thing is that when Aries rises, the rest of the ecliptic runs up into the sky and down to the southern extreme, in fact it moves to basically the same place as we can imagine the sun is at on the winter solstice. That shallow angle is made. And when Libra rises, the rest of the ecliptic runs up to the north toward where the summer solstice sun is. What this means is that because we are not on the equator and looking above our heads but are instead looking down south at this, we are basically looking at the ecilptic making an angle either away from us, down south, closer to the horizon like the blue line, or we're looking at it so that the ecliptic runs more toward our position, more north, and so the angle is wider. Of course the angle of the ecliptic and equator remains the exact same, but that is not what we're looking or focusing at, instead we're focusing on the angle the ecliptic makes with the horizon - keeping in mind that the ecliptic runs at an odd angle to the equator, north and south of it. As a result, if we follow the zodiac along the ecliptic along these angles, we'll notice that when Aries rises, the angle the ecliptic makes to the horizon is shallow, it is closer to the horizon, and the angle it makes at Libra is wide, it is furthest from the horizon, and closer to being over head. The more north we go, the further south these points will be. Now go back to my previous post and notice these same angles - the angle between the horizon and the ecliptic is much shallower with aries rising, and much larger with libra rising. Take note again of the animations to see the effect this has when the earth is spinning, and doing so parallel not to the eclipitc, but to the equator.